Fr. Teresito “Chito” Suganob in a still taken from the ‘propaganda’ video released yesterday (30 May). As the battle for the southern Philippines city of Marawi continues, a priest being held hostage by Islamist militants has appeared in a video, pleading for the President to “consider” hostages’ lives and stop bombing the city. A spokesman for the Philippines army dismissed the video, which was released yesterday (30 May) and circulated via social media, as “propaganda”. Fr. 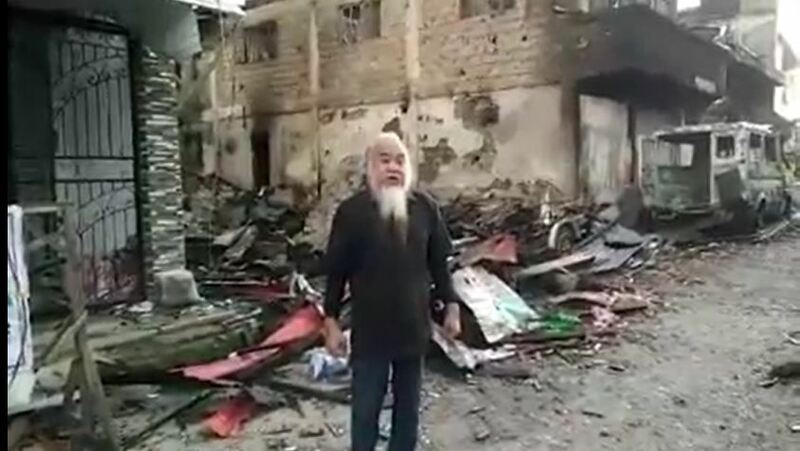 Teresito Suganob says in the video he is one of around 200 people being held hostage by the Islamists who stormed the city last week, setting fire to buildings including a cathedral and Christian college. The militants later killed nine Christians at a checkpoint; local residents identified them as Christians and said they had been pulled from a truck, had their hands bound and then their bodies riddled with bullets and left in a field. Reports continue to emerge of Christians being specifically targeted, forced to recite Muslim prayers and used as human shields. Edwin de la Peña, bishop of Marawi, told Catholic news agency Fides he was “happy” Fr. Suganob was alive but “afraid of the fate of the hostages – about 200 civilians in all – now used as human shields”. Yet there have also been reports of acts of solidarity from Muslims towards Christians, with Muslims reportedly giving Christians hijabs, hiding them in their homes and teaching them Muslim prayers. The Philippine Council of Evangelical Churches called on its members “not to view the actions of the Maute Group as normative to Islam”. Although the Philippines is a majority-Christian country, the region of Mindanao, where Marawi is situated, has a strong Muslim presence and has long been home to violent Islamist groups seeking to create an independent Islamic state. Mindanao’s governor said the militants in Marawi are from three groups – Maute, Abu Sayyaf and the Bangsamoro Islamic Freedom Fighters. Over 100 people have been killed since the Islamists entered the city on 23 May, while, according to some reports, as many as half the city’s 200,000 inhabitants have fled. The source added that the locals, “though they’re used to explosions in the south, this is the first time they’ve experienced an armed conflict where they needed to evacuate. One Christian student [who fled the city’s university] says they’re traumatised by what’s happening. Merely the sound of a truck gives them jitters”.